You may have seen the video last week of Marine Sgt. 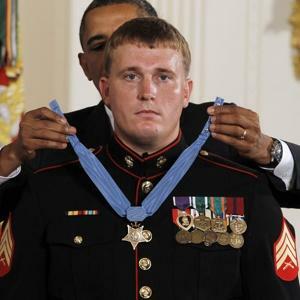 Dakota Meyer in the East Room of the White House. He’s not a man who likes a fuss made over him, and he wasn’t just a guest: he was there to receive the Congressional Medal of Honor from President Obama. He called it the worst day of his life; September 8, 2009. Then-Corporal Meyer and another Marine, Staff Sgt. Juan Rodriguez-Chavez, refused orders and commandeered a Humvee to head to the “killing zone”. Back and forth five times, they rescued 23 Afghans and 13 Americans, also retrieving the bodies of 4 members of his unit, Embedded Training Team 2-8. He suffered shrapnel wounds, but lived to tell the tale. Or rather, have others tell the tale. Now a civilian working in construction in Kentucky, he‘d rather be out of the limelight. And a big reason for his humility is his grief over the five service members who died in that battle: Lt. Michael Johnson, Gunnery Sgt. Edwin Johnson, Staff Sgt. Aaron Kenefick, Hospital Corpsman 3rd Class James Layton and Sgt. 1st Class Kenneth Westbrook. Meyer has shifted the spotlight from himself to his new Sgt. Dakota Meyer Scholarship Initiative, which hopes to raise $1 million with the Marine Corps Scholarship Foundation to pay college costs for children of wounded Marines. He also asked the families of his fallen comrades, who did not attend the White House ceremony, to hold memorial services in their own communities at the same time. The East Room was not the only place where Marines were honored that day. There are many “groups” that have tight bonds of friendship: police officers, sports teams, firefighters, religious communities, fraternities and sororities. But perhaps none have the intensity of the military, particularly in times of war. There are as many stories as there are service members. This is just one. But it’s a pretty damn good one. If you would like to support Sgt. Meyer’s initiative, log onto Dakota Meyer. What a beautiful tribute to Sgt Dakota,Viki. I heard the same story on the evening news but your piece was the one that brought tears to my eyes. You are doing great work and touching many in your mission. Thanks, Kathy. You know how much I appreciate your feedback. I'll tell you, the thing I felt most strongly about when I wrote this was his guilt over not saving everyone. That's why I named those who died, because he accepted the Medal of Honor for them. I heard his story on NPR. What an amazing man. I hope he will get some help for the survivor's guilt. And I hope that his superior officers are dealt with for issuing those orders.